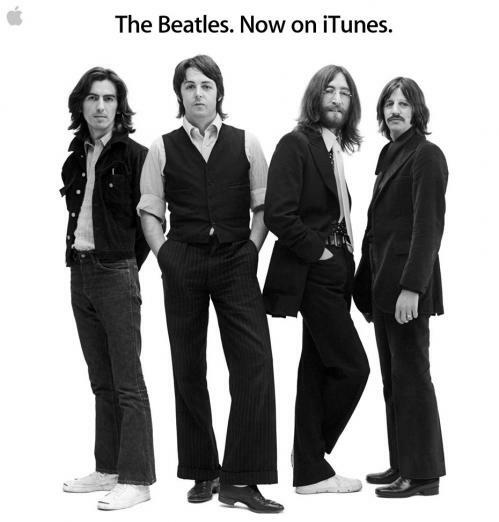 Ahead of Apple's planned announcement scheduled for about half an hour from now that has been expected to see content from The Beatles finally come to the iTunes Store, that content has already gone live. The offerings are headed by The Beatles Box Set, offering a total of 256 songs and other items, including iTunes LP mini-documentary features and a video of the band's first U.S. concert, all for $149.00. Individual albums featuring enhanced iTunes LP content are also available, with the majority of them priced at $12.99 and a few others including "The White Album" and several greatest hits collections available for $19.99. Songs are generally also available on a per-track basis priced at $1.29 each. 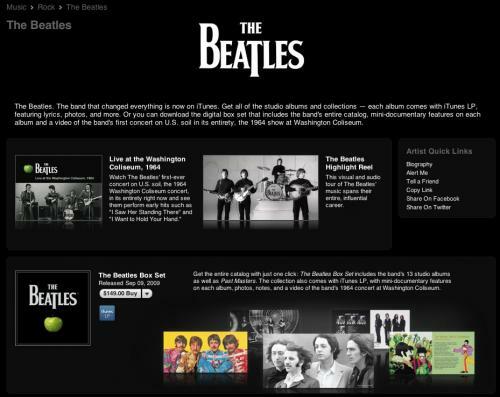 Update: Apple has now updated its homepage to reflect availability of The Beatles' catalog on iTunes, and issued a press release about the release. Apple Corps, EMI and Apple today announced that the Beatles, the most influential and beloved rock band in music history, are now available for the first time on the iTunes Store (www.itunes.com). Starting today, the group's 13 legendary remastered studio albums with iTunes LPs, the two-volume "Past Masters" compilation and the classic "Red" and "Blue" collections are available for purchase and download on iTunes worldwide as either albums or individual songs. Fans can also get a special digital "Beatles Box Set" featuring the "Live at the Washington Coliseum, 1964" concert film, a worldwide iTunes exclusive which captures the Beatles' very first US concert. Apple has also posted a dedicated page on its site highlighting The Beatles and offering video streams of new ads promoting the release and footage of the Washington Coliseum concert. Update 2: According to All Things Digital, Apple has exclusivity on digital distribution of The Beatles' catalog "into 2011". I swear, I've never understood why people liked the Beatles so much. They weren't especially good instrumentalists, they weren't good volcalists, they didn't harmonize well, and their tunes weren't especially catchy, and their lyrics weren't especially interesting or deep. Why the hell were they so popular? Of course, my favorite band is They Might Be Giants, so there's no accounting for taste. :) At least their songs are catchy, they have good instrumentals (even if some of them are electronic), they harmonize well, and their lyrics have meaning below the surface. I can already see that in ten years people are asking from friends "By the way, where were you when the Beatles appeared in iTunes Store?" Yep, why the hell they hyped this I don't know. There's nothing memorable about a release of 40-odd year old songs. Really, Beatles fans will already have the music. The rest of us, those of us with taste, don't care whether you sell it or not anyway. Yay. The overrated Beatles. :rolleyes: Who cares. Wait! Maybe they brought the two dead Beat(le)s back to life!